Los Angeles is chock-full of farmers markets. Some are known to all (hi, Santa Monica), while others are hidden gems (read on to discover). 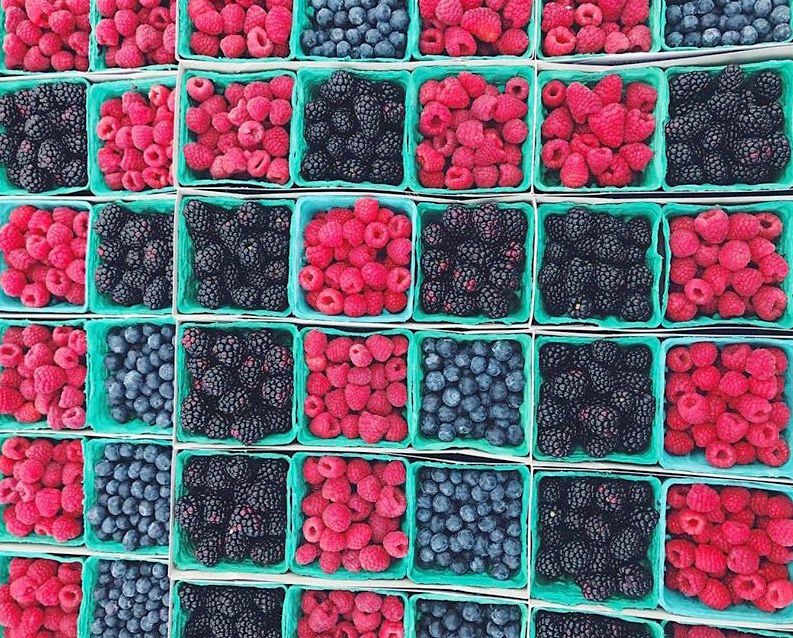 The best time of year is here and it’s prime time for farmers markets. Here’s where and when you can find them. Local musicians provide live entertainment. When: Saturdays from 10 a.m. to 3 p.m.
Where: 3650 W. Martin Luther King Jr. Blvd. When: Fridays from 8:30 a.m. to 1:30 p.m.
Where: The cafeteria patio of the medical center campus, 1011 Baldwin Park Blvd. When: Sundays from 9 a.m. to 1 p.m.
Where: 9300 block of Civic Center Dr. between Third St. and Santa Monica Blvd. Drop your children off at the market’s kid zone while you pick out seasonal veggies and sweet treats. When: Fridays and Sundays from 3 to 8 p.m.
Where: 1831 E. 1st St. The Mariachi bands should be incentive enough. When: Thursdays from 10 a.m. to 2 p.m. Along with produce, you can buy beauty products, flowers, and poke bowls. When: Tuesdays from 2 to 7 p.m.
Where: Main street between Venice Blvd. and Culver Blvd. When: Saturdays from 9 a.m. to 1 p.m. When: Sundays from 9 a.m. to 2 p.m.
Where: 5th St. between Broadway and Spring St. When: Wednesdays 10:00 a.m. to 2 p.m.
Where: Pershing Square by 5th Ave. When: Thursday from 11 a.m. to 2 p.m.
Where: 735 S. Figueroa St. When: Fridays from 10 a.m. to 2 p.m.
Where: 333 S. Hope St. When: Fridays from 5 to 8 p.m. When: Saturdays from 9 a.m. to 2 p.m.
Where: 4801 E. 3rd St. When: Fridays from 3 to 7:30 p.m.
Where: Logan St. at Sunset Blvd. When: Thursdays from 3 to 7 p.m.
Where: The 400 block of Main St. When: Weekdays 9 a.m. to 9 p.m., Saturdays 9 a.m. to 8 p.m., Sundays 10 a.m. to 7 p.m.
Where: 6333 W. 3rd St. When: Tuesdays from 3 to 8 p.m.
Keep an eye out for handcrafted pasta. When: Sundays from 8 a.m. to 1 p.m.
Where: 1999 N. Sycamore Ave. When: Mondays and Thursdays from 3:30 to 7:30 p.m.
At least once a month they bring in local musicians, as well as nutritionists you can consult with. When: Wednesday from 8:30 a.m. to 1:30 p.m.
Where: Salt Lake Park, 3401 E. Florence Ave. When: Saturdays from 9:00 a.m. to 1:00 p.m.
Where: 209 N. Larchmont Blvd. Some vendors arrive early, if you want first pick of the freshest produce. Over 200 farmers and local businesses gather for this one. Where: Grand View and Venice Blvd. You can drop the kids off at story time or cooking classes, and also have the dog looked after. When: Saturdays from 9:00 a.m. until 2:00 p.m. When: Thursdays from 2 to 7:30 p.m.
Where: 1801 S. La Cienega Blvd. Yes, there is live jazz. Where: 3808 Ocean View Blvd. Keep an eye out for special events like their Independence Day car show and Kids ‘n Critters Day. When: Saturdays from 8:30 a.m. to 12:30 p.m.
Where: 2900 Block of N. Sierra Madre Blvd. When: Tuesdays from 8:30 a.m. to 12:30 p.m.
Where: 363 East Villa St. When: Thursdays from 4 to 8 p.m.
There’s a free bike valet for cyclists. When: Saturdays from 8 a.m. to 12:30 p.m.
Where: E. Olive Ave. and S. Glenoaks Blvd. Expect to find everything from rose bushes to gluten-free Korean food to artisanal yogurt. Where: Calabasas Road just west of El Canon Ave.
Where: Owensmouth Ave. between Sherman Way and Wyandotte St.
There’s also clothes, an Arts Village, and children’s activities. When: Tuesdays from 3 to 7 p.m. When: Sundays from 8 a.m. to 2 p.m.
Where: Ventura Place between Laurel Canyon Blvd. and Radford Ave. Your kids will want to go to this market more than you for the train ride and rock climbing. When: Sundays from 9:30 a.m. to 2:30 p.m. When: Sundays from 8:30 a.m. to 1:00 p.m. When: Fridays from 5 to 8:30 p.m. When: Daily from 8 a.m. to 8 p.m.
Where: 245 E. Bonita Ave. When: Sunday from 8:30 a.m. to 1:00 p.m.
Where: City Hall parking lot, 9701 Las Tunas Dr. When: Sundays from 8:30 a.m. to 1:30 p.m.
Where: Heritage Square, 2640 Main St. When: Wednesday from 8:00 a.m. to 1:00 p.m.
Where: Arizona Ave. and 2nd St.
Where: 3700 W. Sunset Blvd. They’ve got fresh food and a lot of vintage clothing. When: Mondays from 8:30 a.m. to 1:30 p.m.
Where: Tierra del Sol Foundation, 9919 Sunland Blvd. When: Mondays from 9 a.m. to 2 p.m.
Where: Plummer Park’s north parking lot, 1200 N. Vista St. When: Thursdays from noon to 6 p.m.
Where: 11338 Santa Monica Blvd. You’ll find award-winning coffee, fresh avocados, tamales, and even books. When: Sundays from 9 a.m. to 2 p.m.; Wednesdays from 8:30 a.m. to 1:30 p.m.
Where: Sundays at 6200 W. 87th St.; Wednesdays at 7000 Manchester Blvd. When: Fridays from 7 to 11 a.m.